I am not very patient. I don’t like waiting for the things I want. And I wanted my fence to look like old barnwood. We installed it several years ago and I had hoped it would naturally weather on its own by now. I finally got sick of waiting so I put my HomeRight Finish Max to good use again and stained that now two toned eye sore of a fence to a calming grey. I first fell in love with this sprayer when I painted my brother’s basement and it did not disappoint when I pulled it out for my fence. I actually did the same thing for this fence as I did for my Secret Garden fence. I used watered down exterior paint as my “stain”. I only want it to be the painted grey long enough for the actual aged grey to occur. I am hoping by the time the paint fades, that it will have that rustic weathered look. I filled my sprayer with the watered down paint and got my trusty paper towels. I always have paper towels on hand for DIY projects. I thought I may need them since the paint was so watered sown ( about the consistency of stain) in case I sprayed too close and there were runs. Now I realize it was probably over kill to wear the safety glasses and mask since it was water based. In fact, when I was done, there wasn’t any of the paint/stain on either of the two. In this picture you can see that the horizontal boards did weather but the slats didn’t. I tried to match the color as best I could. And what is a project without a before and after picture? I am lucky today since I get to give away one of my favorite new tools to one of you! Enter using the rafflecopter widget below. Be patient since it can sometimes take a second to load. *Must be 18 years or older and a US resident to enter. The giveaway goes from June 30, 2014 until July 6, 2014. The winner will be chosen by random.org. The winner will have 48 hours to respond before a new winner will be chosen. 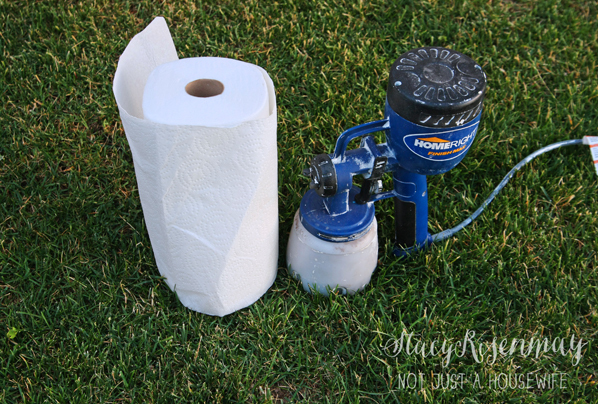 *NEW* HomeRight Sprayer + Giveaway! This is awesome! We found out on Friday that an offer we put in on a house was accepted and it’s a total renovation job! We would use this sprayer to paint the comcrete floor in the screened in porch, paint shutters and stain our fence! And probably more! Would love to have a paint sprayer to help with chores around the house. Thanks. My fence or walls in my house. I don’t know where I’d stop! Would be perfect for our fence which is calling out for attentions! We are moving into our first house, and it’s a big white box, so I would paint… EVERYTHING! 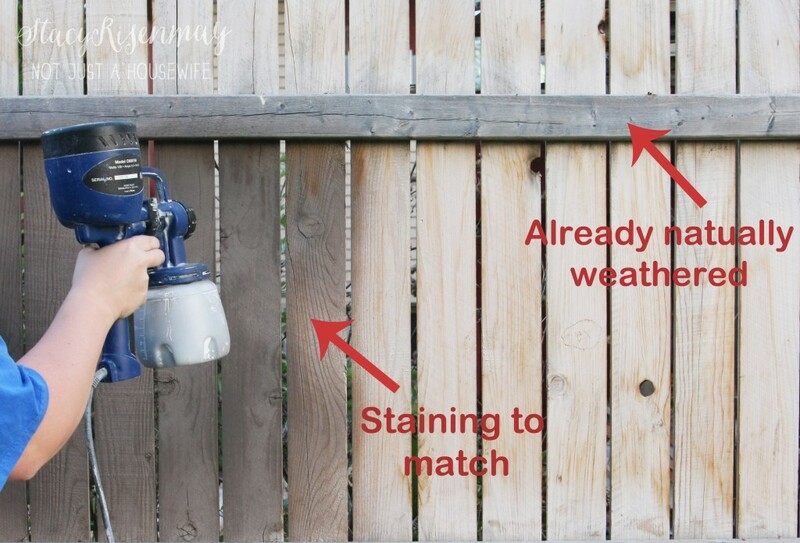 Stain our fence – 100% It needs it SOOO badly. Would gift it to my hubby who is a handyman. I have had my eye on this exact sprayer. I have read great reviews on it! Oops! Forgot to say I would paint first. I have a play table built in my basement waiting for paint. I would love to paint my dining room set- this sprayer would be perfect! Looks great! I would use the sprayer for many many things, just naming a few, paint kitchen cabinets, paint the fence and the whole basement. I would paint our bedroom/closet doors or repaint the exterior of our house (how is it time to do that again?!) or paint all the walls in my sister’s new old house. My dining room table, six chairs, china hutch and buffet…….no small job!!! I would love to stain our kitchen table and our deck! I would stain our deck. The walls and doors in the house!!! Paint the walls and ceiling in our new home. They really need it! The interior of my house! i have some pallets in the garage just begging to be painted for flower beds and other things…..this would be a great help! We have a new “old” home and need to paint many things!!! I would use it to paint some furniture for our bedroom and nursery! We just moved everything around and I need to get on the ball and get painting!! 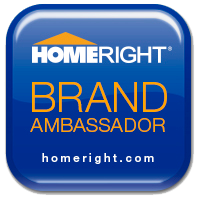 I love HomeRight products and exclusively use their EZ Paint Stick! It’s awesome!!! What wouldn’t I paint or stain? We bought a 3400 sq foot home that is so run down and are doing everything on our own. I have interior door, furniture, exterior projects (fence, gazebo, porches) you name it and it needs to be done! Pick me! Pick me!! Wow, I love spray paint and this sprayer looks like an awesome tool! I have so many projects! It just so happens that I also need to paint/stain my fence — the 5 gallon bucket of stain has been sitting in my garage for over a month now just waiting for me to get started. I also need to repaint my garden shed that hasn’t been painted in almost 10 years! I would definitely start with my privacy fence and move on to my tool shed. Thanks for the chance to win! We are getting ready to do some renovations and paint our drab brown paneling walls! thanks for the chance to win! I would like to try this with our kitchen cabinets and perhaps our living room walls. My fence. It is time to stain it again and the thought just seems so overwhelming. I live on the corner of a circle, which means I have a very small front yard and a huge backyard. When it was time to replace the fence, none of my neighbors could afford to help offset the cost so I paid for it all myself. All I asked was to be allowed the stain their side of the fence to help preserve it. 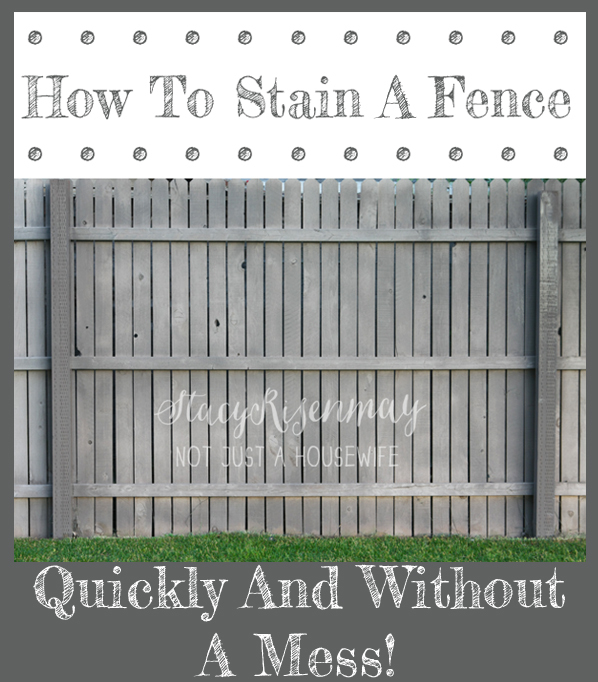 So when I re-stain the fence, I usually do both sides. A sprayer would sure make it a lot easier. Totally perfect timing! After spending 6 grueling hours in cold rain pressure washing our fence, this would be an EPIC help to staining it. I would love this product for my 23′ interior walls! I have a dresser I want to paint yellow! The new bed I am building! The 15 doors in my house are desperate for paint. My poor fence could use a good spraying! I’ve been researching sprayers so I was excited to come upon this! Thank you!! I’d love to finally finish this dresser I’m in the middle of refinishing!! I would attempt to paint my kitchen cabinets! I would paint my kitchen walls – they need some lovin! I want this so badly!! I redo funeniture and remain my house all the time!! I love to change things up and this would sure make everything easier!!!! This is great! 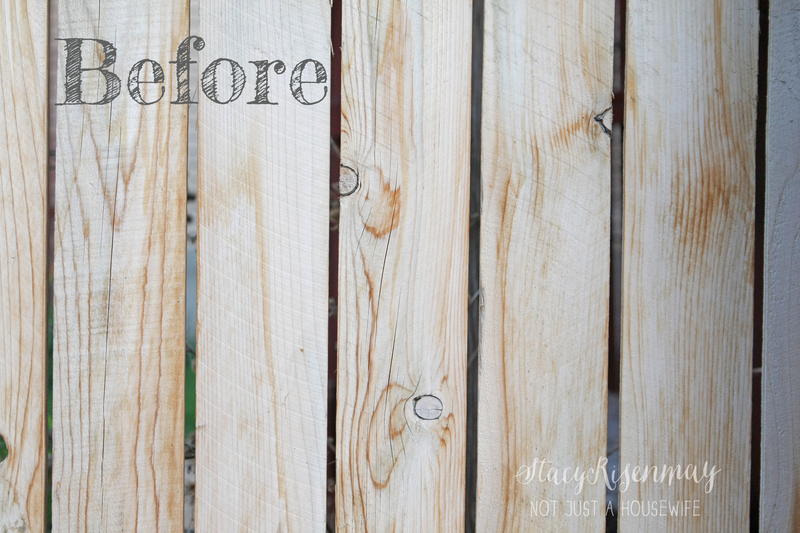 My husband & I just finished building our first fence and this would be perfect when we get ready to stain! The railings around the patio are in desperate need of re-staining. Please pick me Mr. RC! Thanks so much for the opportunity — my fingers are crossed! I sooo need this!! Thank you for offering this contest! 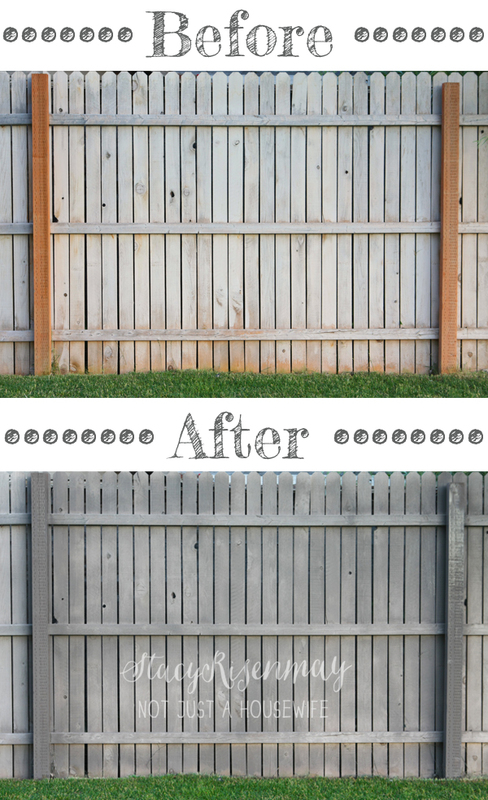 I would stain my patio, my fence and help my parents do the same with their patio! I’d use one of these on my house siding, and the new fence we installed a few months ago. Great giveaway! Too many projects to list. But I would start with my kitchen cabinets. Thanks for the giveaway. The deck in my backyard is 702 sq ft, and in DESPERATE need of restaining! I really don’t want to do it with rollers or brushes! We bought a house with the quintessential white picket fence. But now the white paint is peeling off. So if I won, I would absolutely use this to repaint my white picket fence! My whole house- the outside is stucco and needs painted!! I would paint our basement ceiling white! I would paint my back patio cover. I would stain or table that has had a winter outside. I would also paint the fence, long overdue. I have some furniture to paint just for starters! I would use it to paint my shutters. I’ve been wanting to redo them. 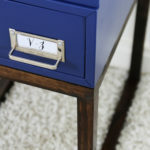 All my #shanty2chic projects I have on my list once our house renovation is completed! My husband and I just bought our first house together and we can’t wait to redo the kitchen. This would be perfect to help us refurbish our kitchen cabinets. 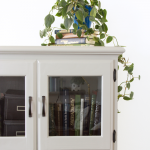 Plus we love to build furniture and frames and any wood project we can think of so it would be perfect for stains, too. A sprayer has been on my list for so long I think my husbands afraid of what he might come home to if I actually had one ! I definitely have a fence in need of some color. And some interior cabinets that I think would look lovely in a new color! I want to paint my upstairs bedrooms ASAP! Our doors are in desperate need of paint! And I never even thought if using it for a fence! This would be perfect to paint the fence I am currently in the middle of building (I didn’t like the ones at the store so I designed my own… Never again)! Our 3 porches could really use a good spray! They are newly restored, but looking a little sad without any color! I would paint my ugly orange fence! I bought stain called “natural”, and it dried to an awful burnt orange, lol! I would use it to stain a very large deck. Our front porch floor has always been painted. I wonder if it can use this to repaint it? My experience with painting is that no sooner do I walk away from it and pat myself on the back for finishing another project, than it needs painting again. There will always be another project begging for attention. I want to try painting some furniture! This would be a great help. 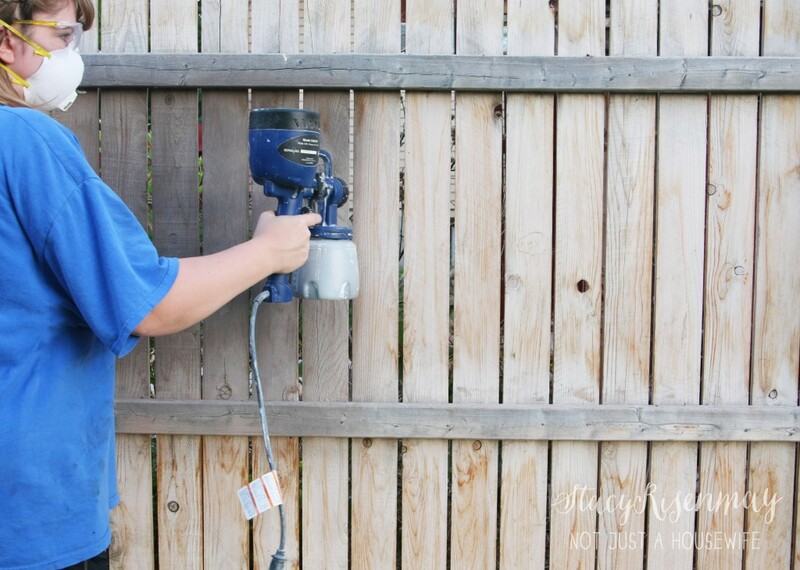 We are getting our old tired fence replaced & I need this paint gun to stain it. I love the pretty grey you chose. The first thing I’d paint is my kitchen. Walls are in serious need of paint. I’d like to paint lower cabinets, too. I want to paint our kitchen island – it’s freestanding. I think the easiest way is to move it outside and spray it, but I haven’t been able to decide on which sprayer would be best. I’ve also got an old fence that needs to be stained. My deck is begging for some love! 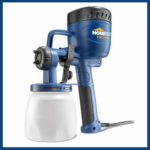 I would probably paint my house…it is stucco and really hard to paint, so this sprayer would be a huge help! Thanks for the good information and for sponsoring a great giveaway! It looks amazing! I would definitely use it to stain our fence also. It is in much need of some love and care! Our climate pretty much guarantees that everything has to be painted every couple of years, so I would repaint the fence, the shed, the house, outdoor furniture… anything that doesn’t move! Toddler bed, front door, shutters, garage door, a million unfinished projects! I need to stain my deck. That’s the first thing I’d work on. I have a hutch that needs painting. I would definitely stain our fence! The exterior of our house! Totally!! I need to stain my backyard wood fence and then when I’m done with that I need to finish painting my front wrought iron fence. Our backyard shed & carport!! We just purchased a house that has each room painted a different vivid color, yellow/orange, bright Shrek green, purples, greens. I would love this to help me get a cohesive color palette! I would love to win! There are SO many projects I would like to do. 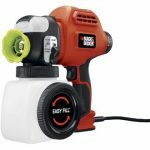 I would use this awesome tool on all my DIY projects!! I have been dying to try this sprayer out especially on my kitchen cabinets and my fence!!! I really really want one of these but can’t afford it. We would probably paint our kid’s outdoor furniture first (it is in the most need). 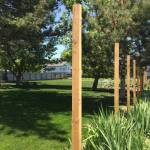 Your fence looks beautiful! And oh my how easy would it be with that sprayer! I have all sorts of pieces of furniture I would stain / paint! Thanks for the giveaway!! My deck needs it badly! We are in the beginning stages of fixing up our first home as newlyweds — A paint spray would come in very handy… especially for spraying the fence like you did! I would love to repaint all the doors in our house that are peeling and look horrible. I had no idea you could run stain through a sprayer! Awesome! I’d use this on craft projects. I wanna be like a boss and SPRAY all my wood projects!!! We have so many projects that we could use this for! Our niece’s room, our garden fence, etc! 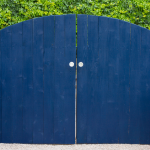 My never ending To Do List includes a massive fence painting project, paint a shed, stain a deck…. We just bought a new home and are in the middle of a ton of DIY projects. After that, we are going to paint the whole house. I would paint some furniture! Walls! My entertainment center! Everything! I would definitely paint the fence around our back patio. It is so tired and worn – it could really use a lick of paint! I would paint and stain all the furniture I’m starting to build. It would make it soooo much easier. I have some wood pieces that would take so long to do by hand and a sprayer would certainly knock that job out in a bit. Thanks for the opportunity to enter. I have some lovely dining room chairs that I want to paint!! Oh, I’ve always wanted one, my first project would be a decorative picket fence in a creamy white color. I need this! I hope I win! This giveaway is perfect timing! Thanks for being awesome! We just bought a corner lot with a huge yard (and long fence). It is half weathered and half not because of our sprinklers. The last owners didn’t treat the wood in any way when they put it up. Needless to say it is the eye sore of the neighborhood. We would love to win! Thank you. Homeright finish is such a great paint sprayer. I use it for most of my painting project.